Tag line: "From 1984 to 1994 a perfect storm of people and circumstances changed the face of animation forever"
"From 1984 to 1994, a perfect storm of people and circumstances changed the face of animation forever". The above title screen appears early on in the 2009 documentary Waking Sleeping Beauty, a movie about one of the most lucrative eras for Walt Disney’s Animation department, when a group of executives and artists joined forces to create some of the finest movies the studio has ever produced. By the early 1980s, Disney’s animation unit was floundering, turning out one dud after another (millions were poured into ambitious projects like The Black Cauldron, which failed miserably at the box office). The studio was ready for a change, which began when Roy Disney, Walt’s nephew and one of the company’s top executives, fended off a possible takeover, then hired Michael Eisner and Frank Wells (former execs with Paramount and Warner Bros., respectively) to serve as CEO and President. Eisner, in turn, brought in Jeffrey Katzenberg to head the film division (one of Katzenberg’s first decisions was to move the faltering animation unit from the building it occupied for decades to an off-lot site in Glendale). Directed by Don Hahn, Waking Sleeping Beauty takes us behind the scenes during this incredibly fruitful period; it’s fun to see footage of guys like Tim Burton and John Lasseter early in their careers, and at times we even witness history in the making (like the sequence where Howard Ashman acts out, mostly with his hands, the musical number that would become “Under the Sea”, arguably the most entertaining tune in The Little Mermaid). 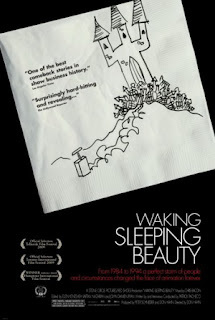 But what Waking Sleeping Beauty does best is recapture the thrill of it all, bringing us along on an unprecedented journey of creativity that helped save Disney’s animation unit, not to mention the company’s cinematic reputation. Through interviews playing underneath archival footage, we hear from those who were there, all of whom reveal, in amazing detail, how magical an era it truly was. Toy Story. The Nightmare Before Christmas. Computer animation (though it was deemed a failure, The Rescuers Down Under was the studio’s first foray into digital animation); these, and many other innovations sprang from this team, this period, and this studio. And even though it was all over by 1994 (Soon after the release of The Lion King, Katzenberg, feeling left out in the cold when he wasn’t named President following the untimely death of Frank Wells, resigned from Disney and, together with Steven Spielberg, formed Dreamworks), what they had accomplished will live on forever. It was Alexander Payne who said in the documentary Z Channel: A Magnificent Obsession that “You just never know when you're living in a golden age”. Well, the men and women who contributed to Disney’s success during these years knew it, and that makes what they achieved all the more impressive.